The Complete Persepolis is in my top three favorite graphic memoirs. I think one of the things the makes Satrapi's work so compelling is her ability to articulate her struggles with self-identity in an honest and humerus way. If you haven't read Persepolis, I highly recommend it. However, I am disappointed to report, I didn't not enjoy Chicken With Plums nearly as much as I did her first graphic novel. I felt it lacked the sense of intimacy and emotions her earlier books exuded. 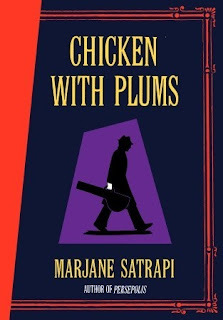 Chicken With Plums follows Satrapi's great-uncle, the famous tar musician Nasser Ali Khan. The novel opens as he discovers his beloved tar is broken and thereby decides he no longer has a reason to go on living. We are then taken from the present to flashbacks and flashforwards, learning more about Nasser and the reasoning for behind decision to give up. I found the end of the novel quite lovely, but I thought the majority was missing something. As always, Satrapi's artwork is beautiful and functions to make the story more personsonal. At it's core, this is a love story, and a depressing one at that. It offers a portrait of a heartbroken musician who uses his interment as a way of coping with his sadness. It's a testament to the power of imagination and the power of memories to stay with us, dictating how our future selves evolve. Unfortunately, I just couldn't get into the book in the way I hoped I would. Maybe my hopes were too high since I enjoyed Persepolis so much, but I was a little let down by this one. Oh man, I watched the Persepolis movie and remember being really charmed by it. Iran is often demonized over here, but her outlook is very human. Too bad she couldn't make things work on this one. I really liked the movie as well. It's so closely related to the book, since it used all of the same artwork and narration. 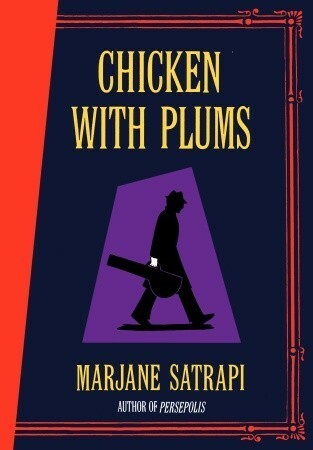 I am really sad to see that you didn't like Chicken with Plums. I loved Persepolis, but haven't read anything else by her. I know it was a bummer. She has another one out called Embroideries that focuses on her mother and aunts. That one may be worth checking out. Bummer. I didn't read the graphic novel, but I saw the movie. I remember really enjoying it and had planned to find it. It looks like you finished pretty quickly and are blowing by everyone in the reading game. Is this your second graphic novel of the year? If you can ever get your hands on Persepolis you should. It's fantastic. This one was on the shorter side so I breezed through it. Are You My Mother? is my second graphic novel of the year. It's so good! Way better than Chicken With Plums. I think I will steer clear of this one as I loved Persepolis so much. Like you, I think my expectations of it would be much too high. I loved Persepolis too and I read this one last month (my review is scheduled to go up in a week or two). I was disappointed in it as well. It lacked that humor and intimacy from the books about her own life. I still have Embroderies on my shelf and I'm looking forward to it. Couldn't get into this one either. I loved both Persepolis books and her book, Embroideries, but I didn't get too far in this one. I agree on both counts. I didn't like it as much as I hoped, and I think it was mostly due to absurdly high expectations due to the awesomeness of Persepolis.